Halloo - What is the difference between Find-Me and Follow-Me? What is the difference between Find-Me and Follow-Me? The Find-Me feature allows you to direct callers to a particular line based on a pre-programmed schedule and other criteria. Go to the User Settings tab associated with your extension. With the options on the tabs, Voicemail, Forwarding, and Schedule, you can configure a variety of ways for your Halloo system to find you at any time of the day, week, or night. 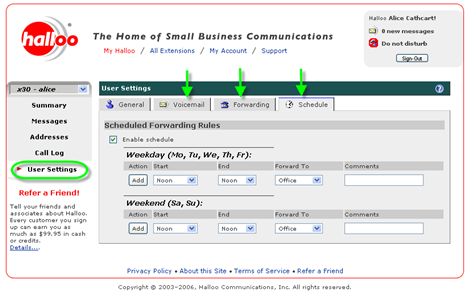 The Follow-Me feature allows you to temporarily override your rules to force calls to a particular destination. To change your current Follow-Me setting, make a new selection from the Location menu on the top of the My Halloo screen.